Iowa State University, President Steven Leath says he has received a lot of support for his decision to cancel the Veishea celebration this week in the wake of violence early Wednesday morning. Leath plans to assemble a task force to decide if the 92 old celebration will be shut down permanently. Leath says although Veishea has a history of problems, a surge of social media fueled the latest riot. “This event went from 300 people to over a thousand in less than 11 minutes. And people were flocking there with their smart phones in hands knowing that there was an issue there, knowing there was an event, and coming to see what was going on,” Leath says. One person was seriously injured in the rioting when a light pole was torn down and fell on him. 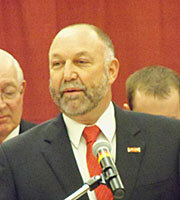 Leath made his comments on Iowa Public Radio’s “River to River” program. Ames police issued a list of five people who were charged or cited in connection with the rioting. One of those is an Iowa State football player. Twenty-year-old David Irving was charged with second-degree criminal mischief, a felony, along with fifth-degree theft and disorderly conduct, which are both misdemeanors.